This week I started 2 classes on Coursera and even completed the lectures and assignments for 1. This isn’t my first experience with online courses. In a way, I’ve taught online before, myself. I’m a big fan of both education and the web. They make a great combination. Coursera is the best MOOG I’ve tried. Starting with the little things like the registration process, the class discussions and announcements, the student experience is great. Easy to use, just the right amount of emails and good control of the settings. When it comes to the class itself, the delivery is awesome. I’ve watched lessons on my laptop and the iOS app. I’ve watched a few of the lectures at 2x speed when the concepts were familiar. Others, I slowed down to .75 speed to review something I missed. I’ve submitted assignments that were automatically graded immediately. I’ve taken a required quiz on my iPhone. Couldn’t be happier with the way this course is delivered from a technology perspective. 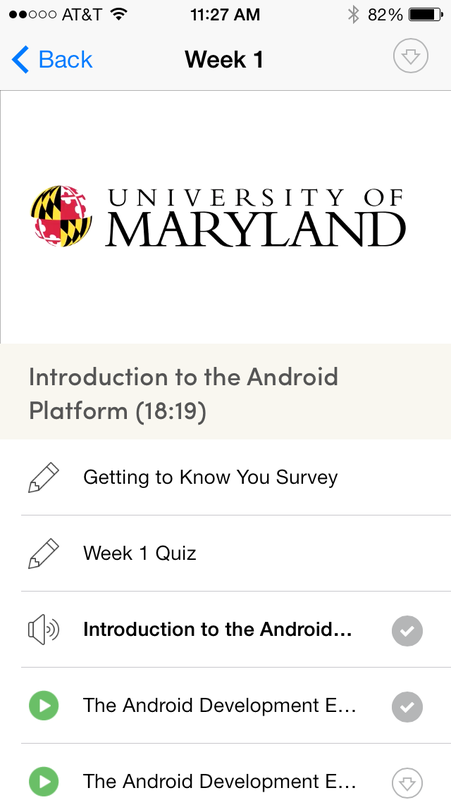 I like Coursera, but more importantly, I’ve learned quite a lot about Android Development this week. One benefit to a live, week by week class, as opposed to just a one time recording, is the opportunity to be up to date on the topic in the lecture and course materials. For example, the lectures in week 1 cover the basics of the Android Developer Environment. Not only did I learn about the most recent tools in the videos, but the lab write up covered even more detail include the latest changes. Another advantage is the online discussion. 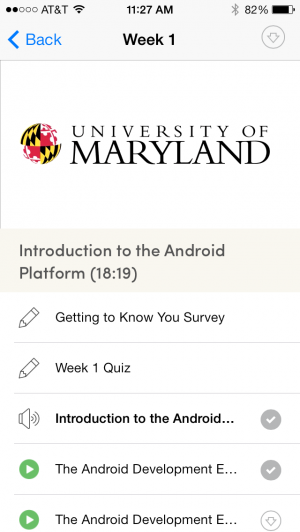 The Android class has 140K students enrolled. The feedback the students give as they are going through the same Week 1 learning as me is very valuable. It’s even been incorporated in the course materials. This type of interaction adds some of the value of in-person classes like at a university. Also, it’s even more than that, because having so many people doing the same course, at the same time, gives the other students and the teachers good feedback. If you’re considering exploring the world of MOOCs, I highly recommend it. Coursera isn’t the only option. And, I’ve only just begun 2 courses. However, I can tell you this is a much improved experience over previous MOOC’s I’ve tried. You may find a course you like, at the convenience of your device, where you want and with a huge community of support.